VFL: Saturday's win in 60 seconds Get a snapshot of Collingwood's 38-point win over Coburg in 60 seconds with Collingwood Media. A healthy Ben Reid played three quarters in defence as Collingwood's defence limited Coburg's opportunities in front of goal. Photo: Shane Barrie. It was a case of another suburban VFL ground conquered for the VFL Magpies as they defeated Coburg by 38 points at Coburg City Oval on Saturday. Lining up with what was arguably their strongest side of the year, Collingwood appeared dangerous from the outset and never surrendered an early lead. The positive news continued in the rooms after the game as the returns of Ben Reid and Clinton Young were hailed a success. Young sat out the first quarter before playing the remainder of the game on the wing while Reid showed composure in defence before resting in the final term. While Collingwood VFL coach Dale Tapping admitted sitting out players at key stages of the game was a challenge, he believes today’s side was capable of handling any Coburg challenges. “If you go by individual personale, it probably was the strongest team we’ve played (with),” Tapping told Collingwood Media post game. “We had a little bit of management around players today with Reidy to Young and Sam Dwyer as well. With a constant wind swirling across the ground, effective ball use became essential. Collingwood kicked four first quarter goals but key errors in the second term allowed Coburg to remain in touch. “They scored five of their goals in the first half from our turnovers… We went against our pattern of playing and we paid the price,” Tapping recalled. What eventuated was an eight goal third quarter with the Lions appearing helpless against a constant Collingwood attack. Michael Still kicked three goals in the quarter while best-on-ground Tim Broomhead also kicked his third of the game. 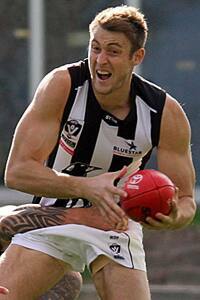 Collingwood midfielder Ben Moloney highlighted the changes which led to his side’s dominance in the second half. “I just think we attacked the ball,” he told Collingwood Media. Still’s four goals raises his tally for the season to 16 goals in six games. At the beginning of the round the new recruit sat equal sixth on the VFL goalkicking leaderboard and will no doubt rise higher when round seven concludes. The positive signs appear set to continue as the VFL Magpies look to win their fifth straight game against the Casey Scorpions next week. Reid and Young will no doubt face extended game time as the side seeks to continue its push up the VFL ladder.